(a) Turn the ignition switch to OFF, and depress the brake pedal more than 40 times (until the pedal reaction feels light and pedal stroke becomes longer), and adjust the fluid level to the MAX level. (b) When the ignition switch is turned to the ON, brake fluid is sent to the accumulator and the fluid level decreases by approximately 5 mm from the level when the ignition switch is off (normal). Depressing the brake pedal with the reservoir cap removed will cause the fluid to spray. When bleeding, maintain the amount of fluid in the reservoir between the Min. and Max. lines. If the brake master cylinder is disassembled, the brake line is disconnected from the brake master cylinder or if the reservoir becomes empty, bleed the brake master cylinder. (a) Turn the ignition switch to ON, and wait until the pump motor has stopped (step A). Pump operating sound can be heard. (b) Turn the ignition switch to OFF, and depress the brake pedal more than 20 times (step B). When pressure in the accumulator is released, the reaction force becomes lighter and the stroke becomes longer. (c) Repeat step A and B 5 times (step C). (d) Turn the ignition switch to ON, and check that the pump stops after approximately 8 to 14 seconds. If the pump does not stop, repeat step C again. (a) Turn the ignition switch to ON, and wait until the pump motor has stopped. (1) Connect the vinyl tube to the brake caliper. (2) Depress the brake pedal several times, then loosen the bleeder plug with the pedal held down (step D). 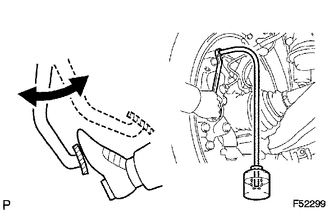 (3) At the point when the fluid stops coming out, tighten the bleeder plug, then release the brake pedal (step E). (4) Repeat step D and E until all the air in the fluid has been bled out. 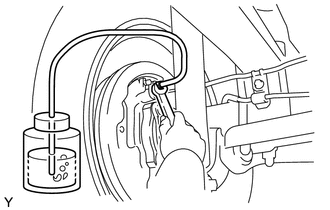 (5) Repeat the above procedures to bleed the other brake line. (1) Connect the vinyl tube to the wheel cylinder. (2) Depress the brake pedal, hold it, and then loosen the bleeder plug. Brake fluid is pumped out automatically. 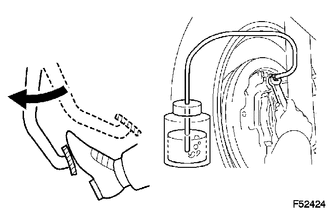 (3) Loosen the bleeder plug and release air. 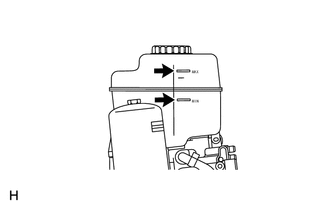 Keep brake fluid in the reservoir tank above the MIN line during the above procedures. (4) When the air is completely bled out of the brake fluid through the bleeder plug, tighten the bleeder plug. If the brake master cylinder is disassembled, the brake line is disconnected from the brake master cylinder or if the reservoir become empty, bleed the brake master cylinder. (c) Select "Active Test" mode on the Techstream. (d) Connect the vinyl tube to the rear wheel cylinder. (e) Loosen the bleeder plug. (f) Select "TRAC Solenoid (SRMF & SRMR)" to drive the solenoids and bleed air from the rear wheel cylinder (step F). Brake fluid is sent through the pump. To protect the solenoids, the Techstream turns OFF automatically 2 seconds after every solenoid has been turned ON. (g) Repeat step F until all the air in the brake fluid is bled out. (h) When the air is completely bled out of the brake fluid through the bleeder plug, tighten the bleeder plug. (i) Repeat the above procedures to bleed the other brake line. (j) Turn the ignition switch to OFF. (k) Turn the ignition switch to ON. (l) Clear DTC (see page ).